The person behind the Natori clothing is none other than the ever-so-faboosh, Josie Natori. My beloved mother-in-law. Busy as a bee, always traveling around the world and back before I can even get my cup of coffee to my lips, she has more energy than the energizer bunny (seriously). Despite the fact that we live so close to each other, her schedule is so go-go-go-go-go that there are weeks, months, that go by that we don’t have the opportunity to sit down and have a real conversation! As one would expect, she is even more beautiful, more glamorous, more over-the-top, more opinionated, and more intellectual than any photo-shoot or magazine article can display. She is a lady that has it all. I love listening to her opinions on fashion and everything else, and I am sure all you would too, given the chance. So here is an interview that I did with her — over email instead of in person, because hey, in this past week alone, she was in the Philippines, NYC, and Paris. Seriously. Tired just thinking about it. I hope to interview her for the blog more often. She has so many fun tidbits to share! I design for women who enjoy feeling good, feminine and glamorous from day to night! What do you think is the main distinction between Josie and Natori? Natori is timeless luxury fashion that is indulgent while Josie is more fun, spirited, mix and match and more carefree. What is your favorite Josie item for F/W 11? Love the screen prints and the OTHERWEAR pieces that the Josie girl can wear from day into night! What is a must have for winter in NYC? My style is simple, classic and timeless with bold accessories. What is your go-to outfit for the winter season? What are your secrets for staying and looking so young? I don’t look so young!! I accept aging but I think being busy and happy with my life and work keeps me young…. If you are tired, what do you do to re-energize yourself to look good? When I am tired I listen to my body…I have a massage and sleep a lot, like 12 hours! Looking forward to celebrating our 35 year anniversary of NATORI…40 years of marriage and my 65th birthday…..best present is having another grandchild coming!! What do you think the future of Josie is? Where do you see Josie in 5 years? I see Josie as the brand that will resonate with the daughters of the Natori women who prefer a more fun and spirited approach to their lifestyle choices in fashion , home, travel, food etc. Eventually I see the Josie girl appreciating the Natori sensibility. I hope to see Josie capture the attitudes and choices of the younger generations that have a more carefree attitude. There you have it folks, words from the wise! 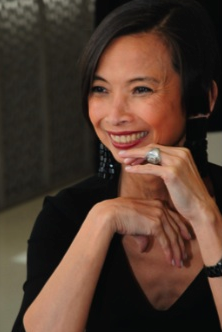 What questions would you love to ask Josie Natori? Before every season, I ask her fashion questions (what is my go-to-piece this season? Color I should shop for? etc…) but what burning questions do you have? Send them to me and I will ask away! Wish I could sleep 12 hours in one night!!! What a dream! Slippers were great… and the umbrellas! My mom has a Natori umbrella with the most beautiful print. She always gets so many compliments. I’m in college now and would like one for myself. The prints are fun, unique and always makes me smile on a rainy day! You have a very special mother in law. Although I only met her briefly at a Saks event, your description is right on. She is such a positive, caring, stylish and intelligent person. It is rare to find a designer and person like her. Thanks for the terrific interview!